Do you know Google+ Social Statistics? This service much like Twitter Counter for Google+, which also provides an extension for the Chrome browser. 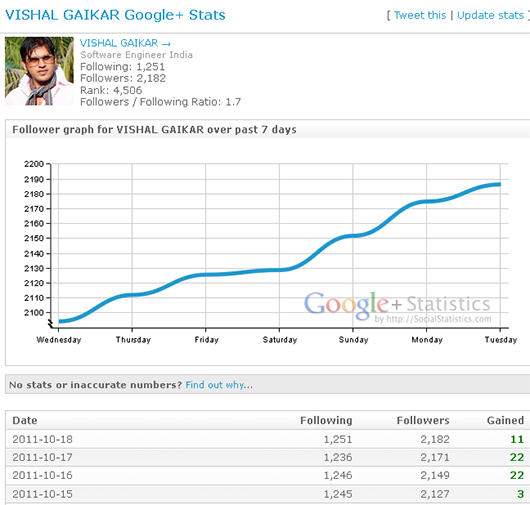 Social Statistics lets you track the number of subscribers to your Google Plus profile. Google+ Statistics currently tracks and generates detailed statistics for users and pulls in hundreds of the most popular posts, every second of the day, from Google+. Google+ Statistics currently tracks and generates detailed statistics for 76,802 users and pulls in hundreds of the most popular posts, every second of the day, from Google+. Add yourself (see sidebar) so we can start tracking your personal Google+ statistics too. Visit the official website and see how many people added you to their circles, how you grow over time and where you rank in the list of popular Google+ users.